Classic Rhythm has developed a reputation for giving original and exciting workshops and presentations for children of all ages. These include some of their own specially written musical stories such as “The Prince and the Four Servants” and “Seige!”, illustrating over 35 different instruments through musical excerpts. “The Prince and the Four Servants” is a Grimm’s fairy tale, adapted and modernised to suit children aged 5 – 11 and “Seige!” is an entertaining historical tale written for the group by BBC playwright Nick Storme. 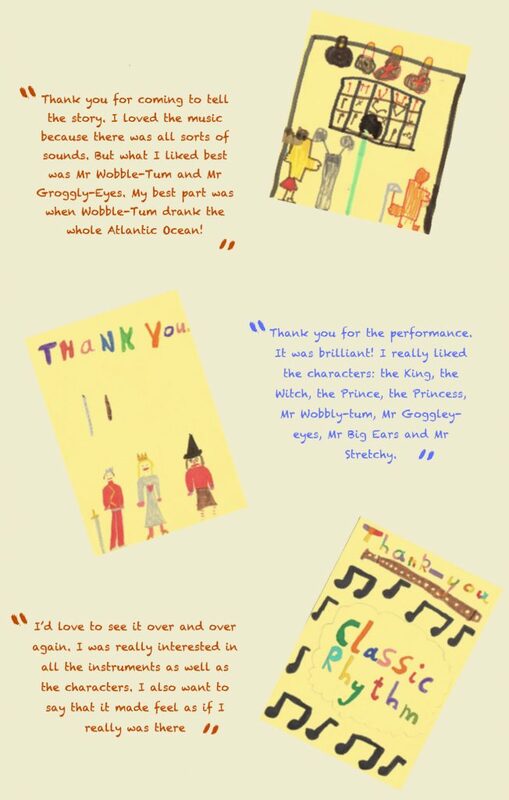 The witty scripts and enchanting music go hand in hand with the demonstration of all the group’s instruments at the beginning and a chance at the end for the children to ask questions. In addition, their participation workshop, “The King Who Loved Music” is another children’s story in which the children themselves perform the music. The score is carefully designed to include all possible instrumental combinations and to be playable by children of all levels of ability and experience.